Remember that one NES game that you played every night for weeks then never got back from a friend you lent it to? This guy probably has it. And thousands of other games from the 1980s and 1990s, too. He's selling his entire collection for a whole lot of money. This set includes every licensed non-recalled NES game that Nintendo produced in America. All the classics, all of the Rares.Flintstones Surprise at Dino Peak, Little Samson, Bubble Bobble 2, Panic Restaurant, Mega Men 1-5, ect.The list goes on and on.Note:Stadium Events was a recalled game pulled from the store shelves and not part of this set.I do have a neat foil label homebrew of Stadium Events that is included.It the only game in my collection that is used as a place holder for an original North American released game. 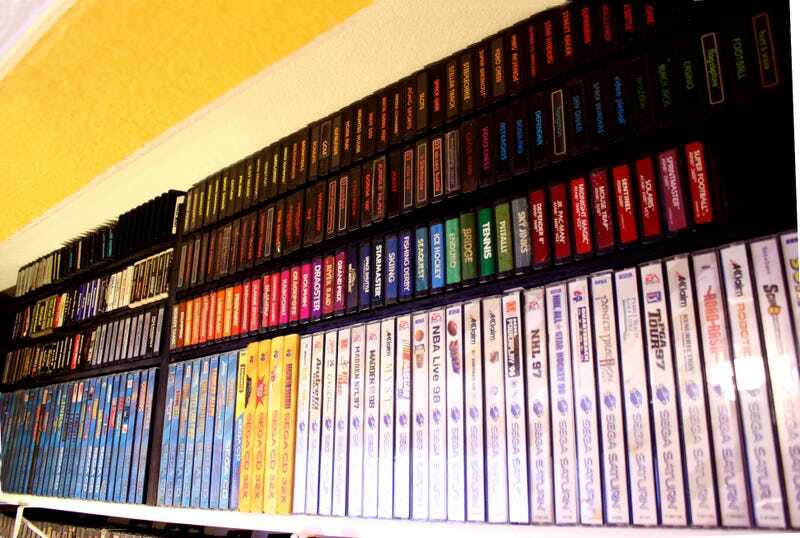 This includes a complete Tengen Set, many AVE, Bunch, Color Dreams, Camerica, AGCI and others.Includes many rares like Action 52, RacerMate Challenge II and Caltron 6 in 1. Fantastic Homebrew of Mr. Gimmick, I true masterpiece on NES, and others.Homebrew games like Battle Kid 1 & 2.Out of print retrozone releases 8-Bit Xmas 2010, 2011, 2012, 2013.A few interesting and odd pirate games as well. Many very hard to find screw variants like Donkey Kong 3-screw, Donkey Kong Jr. 3-Screw, Jaws, Skate or Die, not many examples of these rare screw variants are known to exist. - Dust covers for every single NES game. Wow, this one I'm excited to talk about.This may be the worlds largest North American Gamecube collection in a private collectors hand.Not only do you get every retail Gamecube game, it also includes every Player's Choice version, every regular sized box set, every known variant, almost every demo, and a handful of other rares like development copies, ect.784uniqueGamecube games in total.There's not another set like this out there, but I'm getting ahead of myself. This set was truly a labor of love. In addition to having every "black label" regular release, this set also includes every Player Choice variant.Gamecube games were sold as "Player Choice" once they became million sellers.So those games were often of very high quality.Every single one is included here, over 100+ titles. These Box Sets are always hard to find.They are regular games that come with a bigger outside cardboard box.They still fit on the shelf nicely, but often times came with a Microphone.Games like Pokemon Box, Resident Evil, Zelda, Mario Party and more are included. So many awesome and hard to find cover art variants are included.I wrote the visual guide on Nintendoage for Gamecube variants.Some of these took months to find and they are all included.Every known variant is included. See full list of games for more details. These are highly sought after an many very hard to find, Naruto Demo, Soul Caliber II Demo, October 2001, January 2002 (both sealed), many more.Over 40 in total. This speical NR disks are very rare, possible one of a kind items.This includes Baldur's Gate Dark Alliance (NR Disk), Virtua Quest (NR Disk) and the most unique item Alien Hominod.This NR disk version on Alien Hominod is from what I can tell from the "Independent Game Festival" it comes with a Playstation 2 copy as well as cover art and instruction. In all my years of collecting I've never seen another copy like this. I truly unique and exciting piece. - This is a complete Sega Master System set. Every North American released Sega Master System game is here. All the rares, James Buster Douglas, Psycho Fox, Ghouls 'N Ghost, Alex Kidd in Shinobi World, Phantasy Star, ect. The vast majority are complete in box. Also included is the unique PAL release of Sonic the Hedgehog 2, a game that did not come out in the United States. I'm not leaving the site or collecting, but I am open to selling everything if the right offer came around. I'm currently in the process of moving. The house is going up for sale next week and everything collection-wise is boxed up. I have the opportunity to build a new house but will most likely not be ready to move into that house for another year or more. In the meantime, since the collections boxed up, since I'm going to have a great deal of house building expenses I thought what the heck, why not list it all. One of two scenarios will happen. First, I get a good enough offer, sell the collection put 95% of that money towards the house and leave the remaining 5% for a new game collection. If that happens my next collection will be much more small scale. Local garage sale, thrift store finds. Without a doubt my passion for retro gaming, collecting and the community has not diminished at all. Second, if I don't get a good offer, then that's fine, I'll hang onto it and continue to enjoy it, no big deal. I am planning on having a gameroom in the new house either way. It should be interesting I guess we will see what happens. A collection like this is the kind of thing that you'd hope a museum would buy, keep in working condition and make available for future generations to play. Let's hope some of the cultural institutions that have started to catalog video games as an art form are watching this auction. Potential buyers: makes sure you get those awesome custom shelves, too.